Pictured here is our newly renovated/redesigned breeding facility. After many years of testing different methods of raising and breeding dragons, we now have a better understanding of how small changes in husbandry can have both positive and negative effects in keeping and rearing large groups of dragons. In rearing large groups good husbandry is often about finding a balance. We applied that knowledge to designing our new breeding facility and will highlight a few changes we made below in an effort to consistently produce some of the healthiest dragons on the market. To improve the air quality, almost everything here is now a hard, cleanable surface – from the concrete floor which is steamed cleaned, clear up to the bug bins. No more carpeting or particulate substrate to be found here. 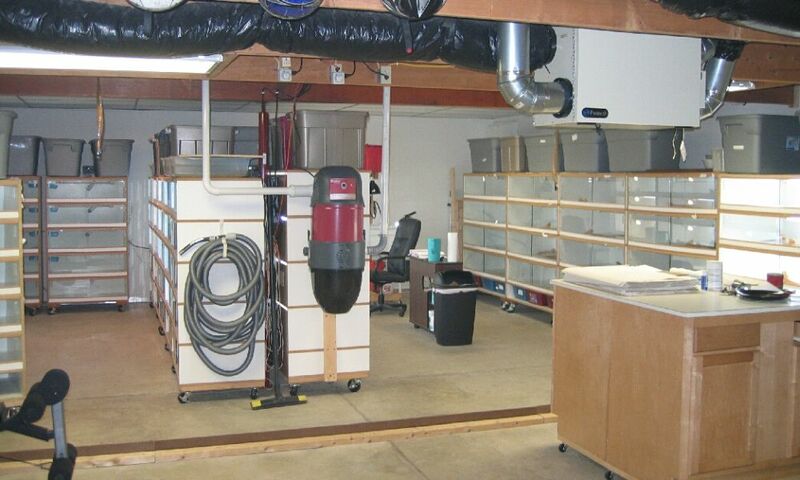 Mind you, a loose substrate is perfectly fine if you only have a few cages – but the more cages with substrate, more of the substrate’s dust will get into the air. And we have quite a few cages – which means a lot of dust. We’ve installed a central vacuum (its the red-robot-looking-thing in the middle of the picture) which vents all contaminates that get through the filter through an outdoor exhaust. 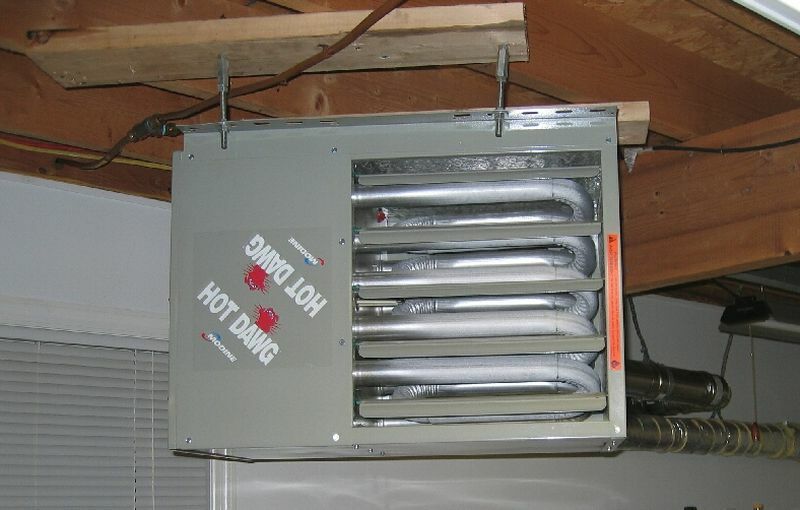 In addition to these measures, and to ensure the best possible air quality in the extreme heat or cold, we have also installed an HRV air exchanger. 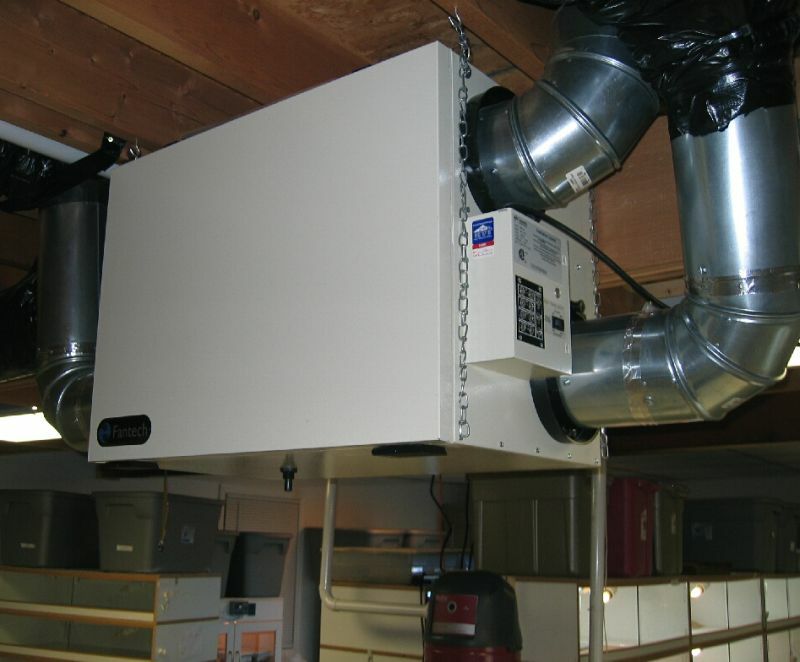 This unit allows us to remove the stale air from within the room and replace it with fresh air from outside in the dead of winter/summer – without losing very much heat energy. Also of note, the HRV air exchanger runs through the evening/night in the summer and the daytime in the winter to promote less energy loss. 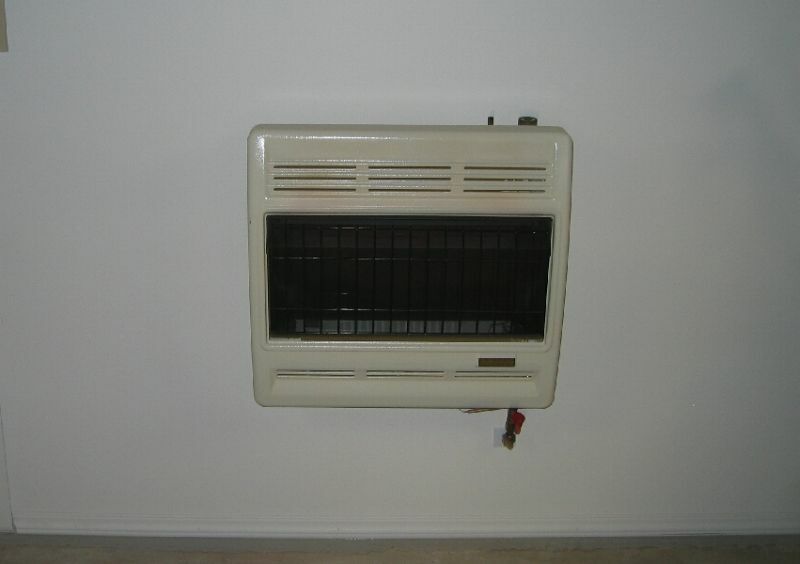 We heat the whole room with a vented propane heater as our main heat source. No more duct work. We also have an unventilated propane heater for back up in case we lose power. If that happens, we simply heat the whole area up to 80 to maintain the eggs in the incubator. We house our dragons in pairs and trios, or if the males are aggressive breeders – alone, to reduce stress. Our adult breeders are housed in 4×2 by 12 inch high cages with 2 18 watt florescent bulbs mounted towards the back of the cage. One bulb is a 5.0 for UVB and one is a 2.0 with a high CRI which improves the overall light quality. 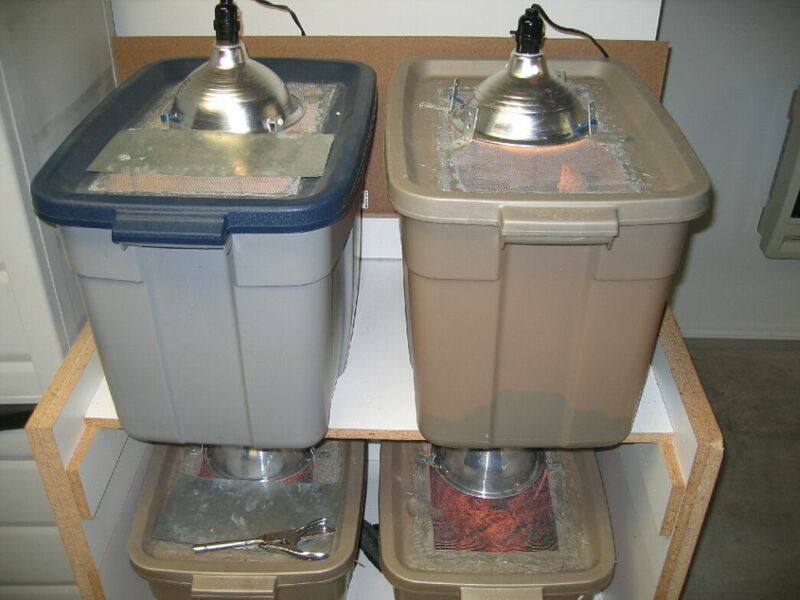 The heat bulbs consist of 7 watt (cfl) in the top cage, a 13 watt (cfl) in the second and third cage down, and a 30 watt (spot) in the bottom cage for all seasons. 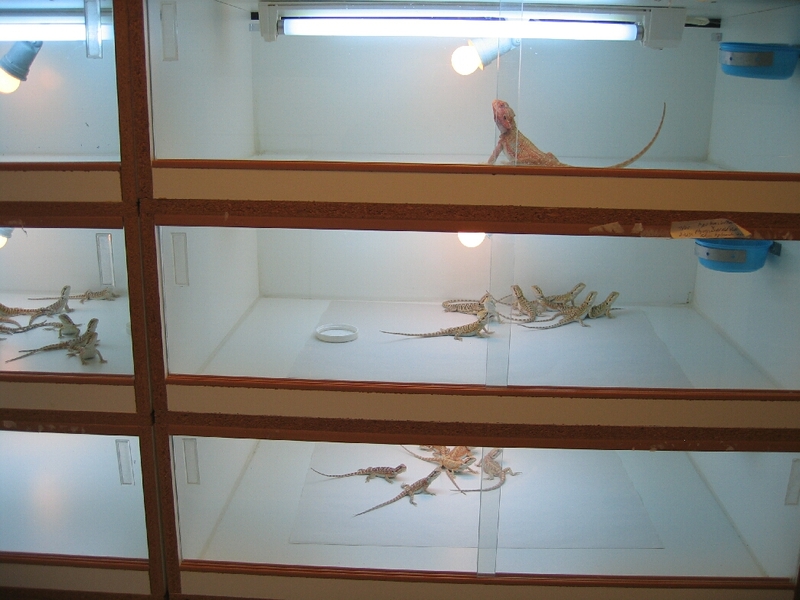 These cages are designed to allow the transfer of heat directly above the florescent light fixtures of the bottom cages to warm the surface of the next cage up. With this setup we are able to provide a 95-105 degree (depending on room temperature) isolated surface temperature under the fluorescent lights – with ambient cage temperatures generally in the 80’s with out using a higher wattage spot bulb. This allows for slightly higher humidity in the cage, which is especially needed in the winter. Because we use very small amount of wattage in the cages, the room and cages heat up very slowly usually reaching peak temperature by 1pm. The cages get a few hours of peak temperatures then are allowed to slowly start cooling by shutting of the heat (cfl) bulbs in the winter, spring and fall. In the summer we never turn on the heat (cfl) bulbs, and only use the florescent lights. If needed during the hot days of summer to cool the room, we use a stand-alone air conditioner for a few hours in the afternoon-evening until the lights shut off. We believe that dragons need to experience a wide range of temperatures throughout a full day and should not be kept in their upper peak preferred body temperatures for 12-14 hours a day. In our experience constant high temperatures may contribute to watery stools, dehydration and malabsorption – and when left ongoing, in combination with other co-factors, premature death. 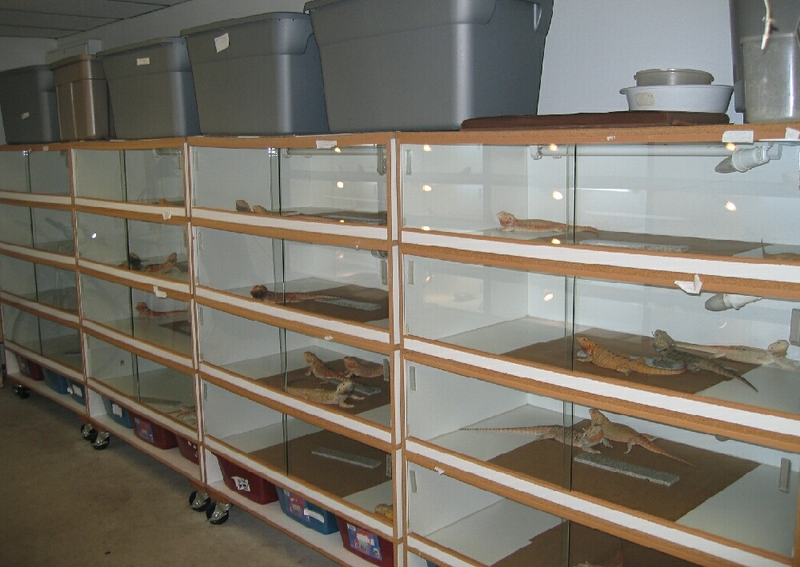 Also, in this latest design of our newer adult cages, we have added 3 brumation bins to the bottom rack. Cycling dragons will be placed here for 6 weeks to up to 3 months for cool-down. Wheels have also been added for ease of cleaning under the cages and also for more convenient access to the bottom cage for feeding and cleaning. Raising the bottom cage contributes to using a lower wattage spot bulb because the bottom cage is a foot or so up off the cold floor, reducing temperature transfer from the concrete. Another notable change we have made is the elimination of our laying cages in favor of laying bins. 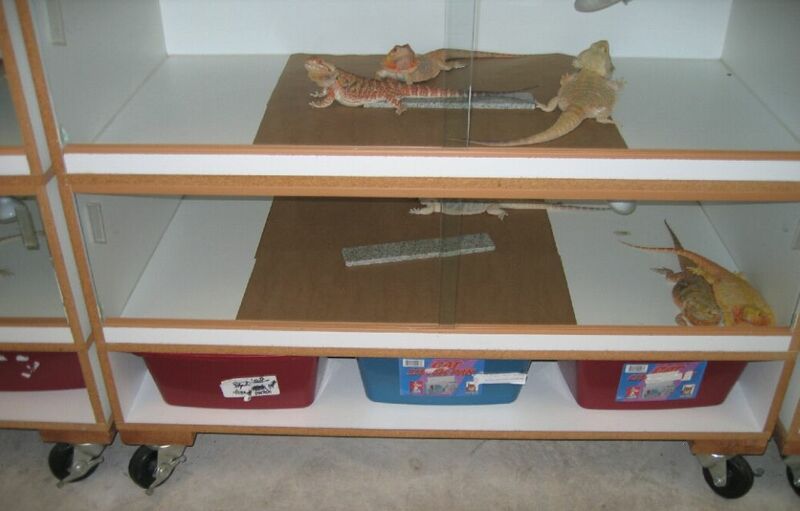 This type of a setup is much easier access – for both setting up the nesting area for them to lay in and also for cleaning. We use coconut fiber as a medium for the females to lay their eggs in, as it is both soft and stable – and easily replaceable. Our incubation is pretty much unchanged. 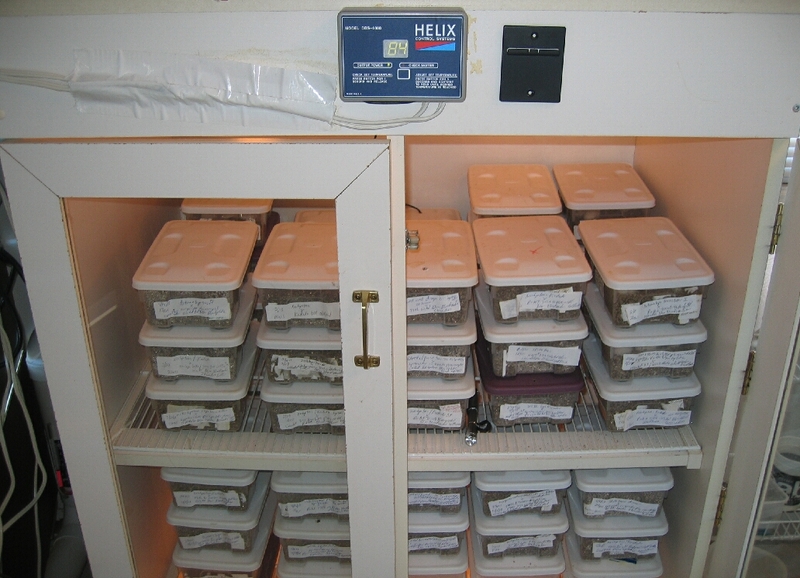 Instead of 2 incubators we cut back to one incubator with our cricket incubator used for any overflow. Above is the main incubator cabinet that we use. The incubator is made out of melamine, with glass front doors for easy viewing. This unit is heated with four 60 watt light bulbs , which are controlled by a Helix thermostat. As you can see we do not humidify our incubator. It’s dry. 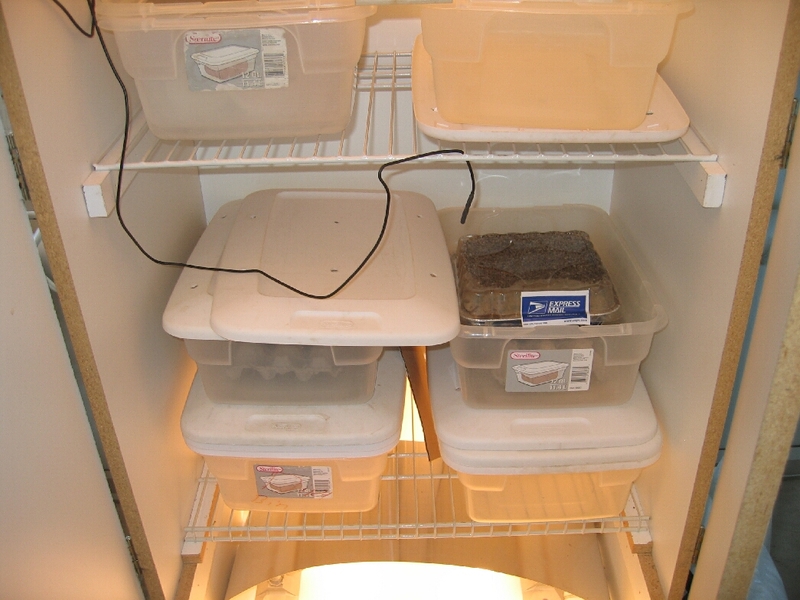 The humidity is in the container and remains there throughout the whole incubation process. We never have to add water to the egg containers. At 84 degrees our average hatch date is between 64-67 days. 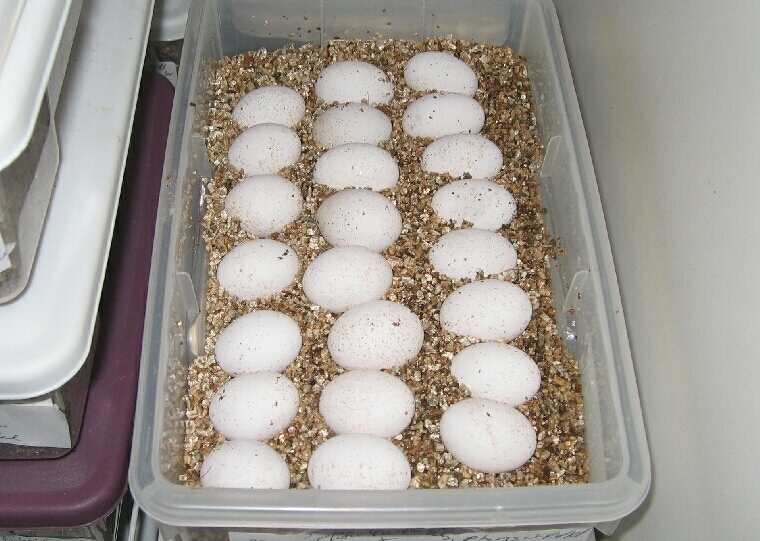 Most eggs hatch over a 1 to 2 day period but some can hatch 4 or 5 days later because of cool spots within the container. This usually happens more-so in the winter months. Our egg hatched rates are now about 95% if the eggs are fertile. Once they are hatched and moving around in the plastic container they are removed and put in our cages. **It is important to remember that the incubator heats and does not cool therefore the incubator should be in a room that is temperature controlled. Exposure to temperatures over 90 degrees can possibly kill developing embryos. Our baby bins are now gone – along with the dust and cobwebs that accumulated so easily no matter how frequently we cleaned. Our babies are now housed in almost the same manner as the adults. Babies reared in a open front cage from birth, seem to have less adjustment issues when finally moved to either a bigger cage or aquarium later in life. This is probably partly due to the fact the babies have already been accustomed to full view of the room from birth, verses rearing in bins. The cages are slightly smaller at 3X2, by 12 high. To compensate for the smaller area, these cages only house 1 florescent fixture with a. 5.0 UVB and are heated easily with a 15 watt incandescent bulb in the top cages and a 30 watt spot bulb in the very bottom cage. The blue deli cup in the corner of the picture holds a few ounces of water and is simply to promote a slightly higher humidity within the cage during the winter months. This water is not to drink, which is why it is mounted high. Varying humidity between 35%-55% is ideal for baby dragons. The baby dragons are sprayed with water towards the end of the day and permitted to drink their fill. The cages are then all wiped out, cleaned and dried, in preparation for the next morning.